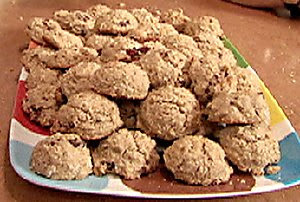 I recently received a sub-batch of these (using cranberries and omitting coconut) from a friend, and I thought I'd share because they supposedly have 10 grams of protein per 2 cookies (they aren't big, so that's pretty darn good). These are soft, a tad dense, but not too sweet. Very good post-run snack. *Cook's Note: If desired, a quarter of the whole-wheat flour can be substituted with lentil flour for a denser, stronger flavored cookie Preheat the oven to 375 degrees F.
So these were good? I guess this picture does not do them y-ustice.